Sometimes, you need to whip together something quick for entertaining. I like to be able to offer something a little different. You know something other than that bag of chips or dip veggies. These are an old standby, I have seen them at weddings but really they can be served anywhere, anytime, and healthy too! Sure mine might not look as fancy but they sure are tasty and easy. Take out your crackers, put a thin layer of light cream cheese on top. Tops with a slice of salmon, three capers, and a bit of dill. Serve! This can serve a number of guests, it really depends on the size of that package of frozen smoked salmon really. I recommend the frozen simply because it keeps in the freezer for a long time and only takes 15 minutes to defrost and get out there! The nutritional info really depends on the brands you use. 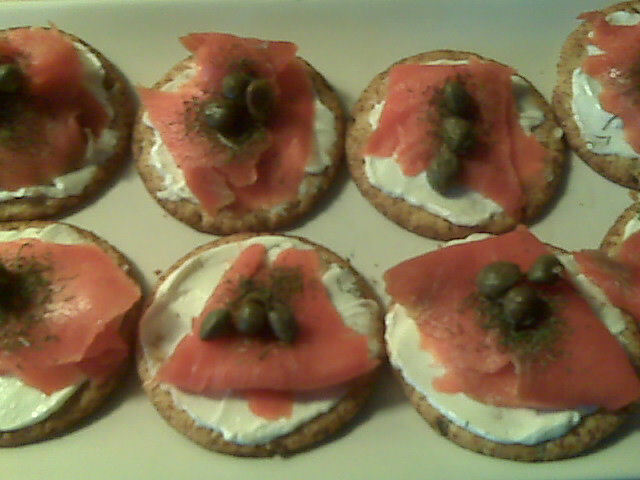 The ones I used were the pc flax thin and crispy crackers, pc pacific smoked salmon, thrifty brand light cream cheese, and no name capers. As you can tell this was also a very cost effective appetizer to put out there as well! For you non canadians out there pc means President’s Choice…which spells awesomeness out here. Hehehe. I love my president’s choice products. This entry was posted in Snack and tagged salmon. Bookmark the permalink.